While the thought of completing a design project with only one color might be intimidating, it can actually result in a pretty awesome aesthetic. Monochromatic color options are also a hot concept and can work for a lot of project types. Monochromatic color is rooted in color theory and takes more than just picking a color and designing everything with it. You’ll want to consider the meaning and associations of the color you choose and how to make that hue work with other components in the page. Here, we’ll explore ways to help you better understand and effectively use monochromatic color in any of your design projects. To simplify, monochromatic color starts with a single hue – anything from red to beige to purple – and the design is created with a palette using derivatives of that color. Sounds simple, right? The top consideration in monotone color palettes is contrast. The biggest dilemma that designers face in monochrome color projects is that nothing stands out in the design or everything fades into a singular background. You can eliminate this feeling with sharp contrast. Starting with a base color, you’ll likely need a minimum of two other options – a darker version of the color and a lighter version. As with any other type of color palette, you’ll need to determine what the use for each color variation is and how it will appear throughout the design. Generally, the rules for using monochromatic color are no different than any other palette; the main difference is that every color is from the same base. Shades, tints and tones are your biggest tools when planning for a monochromatic color scheme. Get familiar with each because you’ll use them to create and mix-and-match within this type of color framework. Base color: The dominant color selected for the color palette. It is the starting point from which all other color choices are derived. Shade: A color and the addition of black to make it darker. Tint: A color and the addition of white to make it lighter, such as a pastel. Monotone color palettes can work for a number of reasons. The use and popularity of monotone options is not limited to any one type of design either. While single-color is popular in website design right now, it is also a favorite of interior designers and for package design. One color automatically creates a sense of simplicity and harmony. It can be easy to design, because you don’t have to worry about matching colors. It sets the scene for a minimal style that gives content room to shine. Monotone backgrounds allow contrasting elements room to be seen. Monotone color schemes provide some accessibility benefits when it comes to users with color blindness. Single-color can make an impression, especially with a strong or unusual base color. Designers using monochromatic design outlines tend to fall in one of two camps – monochromatic purists and those who “break the rules” by adding one more color. Sometimes the thing that can really make a monochromatic outline work is an accent color that stands in complete contrast to the rest of the design. Think about green color palette for a website; now think about the call to action buttons. Would they work better in another shade of green, or as red buttons? Monotone color schemes can work brilliantly with imagery that is part of the same color family, but consider a monochromatic outline for the website design with visuals that are all in contrast to that color element. The images will immediately become the focal point of the design because of the contrast used. Black and white color schemes, which you can argue as being monochromatic or not, can especially benefit from the use of an element of color contrast to set elements apart. While adding another color to a monotone color scheme is not truly monotonous, it can add that extra bit of contrast or element of surprise to help users navigate and use your design. Just that extra color sparingly and intentionally for the best results. Another “rule” of monotone color design is that designers often use it for an entire project. Consider creating monochromatic elements and incorporate them into the design for touches of the trend. 450 GSM (above) does this beautifully with the origami-style bird on their landing page. 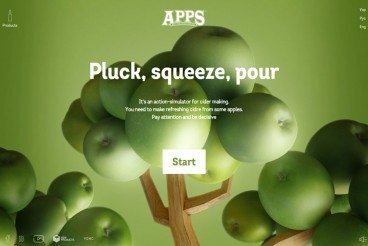 These websites are using monochromatic color and other design trends in inspiring ways. The super-simple site for the Jeet Grid System is easy to see and read thanks to clean lines and a minimal style design. The mint and mint shade add to this minimal effect. Kick My Habits combines flat design concepts with a background and color scheme rooted in a single hue. The purples grab your attention while the other elements – the illustration in particular – help pull you through the site. Monochromatic color is an option that can work for big brands and small. It can be an easy color pattern to implement and design if you think about contrast from the start. Monochromatic color can also leave a lasting impact on users and spark visual interest, especially when used with a color that is not commonly seen or associated with your designs. It’s fun to play with because there are so many different ways to play with this color option. Start small with a two-tone hover action or single-color style business card. Monochromatic color options are almost limitless.